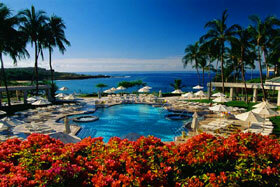 Planning your next Hawaii Vacation or looking for local happenings? Explore Hawaii Health Guide's searchable events calendar and find out what's going on. Lanai has traded in pineapple plantations and ranching for the art of pampering guests seeking privacy in paradise. This small island is home to nesting sea turtles, native dry land forest, endangered plants, and less then 3,000 residents. In addition to the natural attractions of scuba diving, hiking and mountain biking, Lanai has public and private golf courses, a spa, fine dining, golf, tennis, fitness center and horse back riding. Accommodations at the upcountry Lodge at Koele and the ocean side Manele Bay Hotel cater to those wishing an exclusive yet reclusive laid back holiday blending a rural laid back setting with world class ammeneties, unique geography and ranching history. Health and Wellness resources fall into two categories: resort provided activities and services such as massage, swimming pool, golf and tours, and independent exploration of the island via mountain bike trails, hiking, or 4 wheel jeep roads. Snorkeling and SCUBA are available. Be advised that several beaches are dangerous for swimming. The Lana'i Community Hospital operated by the State of Hawai'i open seven days a week. Lana‘i Dialysis Center on Mondays, Wednesdays and Fridays after 1 p.m. For more information and scheduling of services, call Aloha Dialysis in Honolulu at 1-888-502-2283, extension 19 or 20.